All companies do, no matter their size or annual sales. These mistakes can be costly and damaging to the effectiveness and life of your brand. Do you know the top branding mistakes? If you did, you could better avoid them. 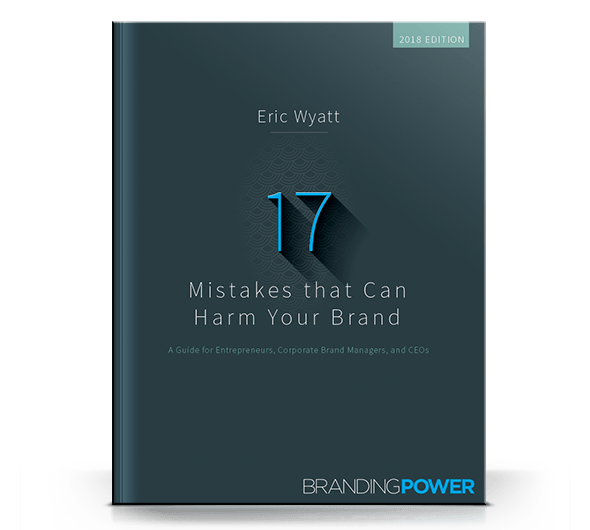 17 Mistakes that Can Harm Your Brand guides you through these all-too-common mistakes and helps you ensure your brand has the power you expect. No matter where you go, branding is a part of what you do. The clothes you wear. The music you listen to. How you listen to that music. Everything has a brand associated with it. Branding and how it relates to you is not solely what you consume; it is also what people receive from you. What do you offer people? Does your brand establish the trust that’s needed to develop a lasting relationship with both prospective and current customers? Over the course of my professional life I have worked with and for people from a wide range of industries, from Fortune 500 companies down to sole proprietorships; from software companies to manufacturing firms. Each of them had a product to sell or something they wanted to offer people. In other words, each of them had a brand. Over the years I became aware of and discovered a thread that was common among all of those companies: They all needed to better understand the significance of the brand they were offering. Quite honestly, your brand is something you should work on day in and day out. When you better understand the mistakes that are often made, you can better navigate the sometimes tricky waters of effectively developing your own brand. A brand is not what you force on people. A brand is what employees and customers make of your company when you’re not looking. In this book I share with you what I view as the 17 most costly mistakes that most entrepreneurs, corporate brand managers, and CEOs often make when it comes to their brand. I have no doubt that you’ll want to examine these potential mistakes and see if you fall into any of these “traps.” If so, now is the time to recognize and fix the problem so that your branding has the power you expect. All sales are through our parent company Sharon Parq, Associates. Since the electronic book is provided in Adobe Acrobat (PDF) format, you need to either have Acrobat or the free Adobe Acrobat Reader. Many computer systems already have the reader installed. If you do not, you can get it free, directly from Adobe.